The 2016 presidential candidate, beaten by Donald Trump in the contest for the Oval Office, is a frequent speaker at conferences and public talks. Her recent speech at one such event, intended as a pep talk for women, received a mixed response online. Former US Secretary of State Hillary Clinton might have hit wrong a cord on Twitter with her address to participants at an annual summit supporting the women’s movement. In a pre-recorded video message, posted online by the MAKERS conference, the 2016 presidential candidate celebrated the “tidal wave of women and young people running for office”. — MAKERS (@MAKERSwomen) 7 февраля 2019 г. ​She pointed to Democrat Nancy Pelosi as an example of such a breakthrough for women in politics. "As Speaker Nancy Pelosi — doesn’t that sound great — has proved yet again it often takes a woman to get the job done", she said, noting that “this is such an important time”. However, this particular example did not seem to appeal to many Twitter users, who pointed out that Pelosi’s list of accomplishments raises questions. Yep. Pelosi elected speaker Jan 3rd, and only about 6,000 Americans have died from overdose since. But she’s clearly getting the job done — i.e. resist regardless of consequences — rather than actually proposing legislation that might slow drug flow down. — David Patterson (@dmpatterson14) 7 февраля 2019 г. When the job is obstruction and resisting what is good for the American people I have to agree. — Paul Douglas (@padota) 8 февраля 2019 г. — Mads Nielsen(I'm a Russian Bot bc I love M4A") (@SocialistnyH) 7 февраля 2019 г. If obstruction is a job duty only a woman can do, then yes, only a woman could be this ignorant. She was elected to negotiate and she can't even do that. — Ron Brooks` (@Ron_Brooks) 7 февраля 2019 г. ​Others slammed Clinton for sexism. That's a very sexist statement. — WKJ2🇺🇸🌵 (@williamkj2) 8 февраля 2019 г. ​Some even accused both the veteran female Democrats of getting Trump elected. — makeitgood (@makeitgood4) 8 февраля 2019 г. The only thing Hillary & Nancy have “gotten done” in the last decade was get Trump elected. — Unify Labor 🌹⏳ (@unifylabor) 7 февраля 2019 г. ​Others trolled Clinton’s financial interests in giving speeches. More advice: "Use you government position to amass as much personal wealth while selling your country out." — Alan R. McCartney (@Fasteagle101) 7 февраля 2019 г. 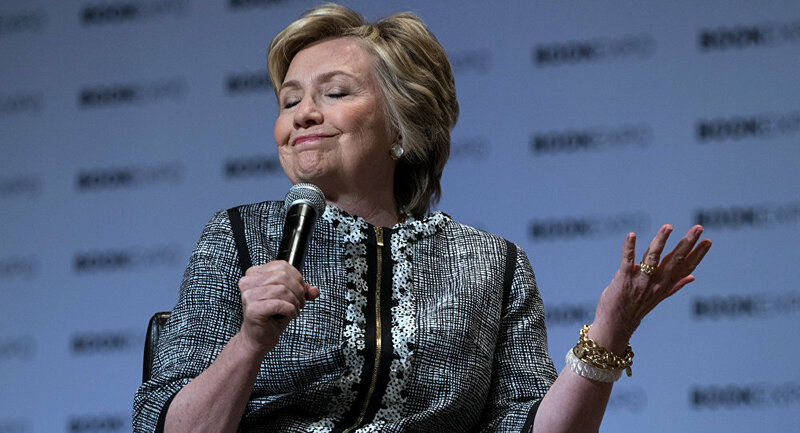 That advice is definitely worth her speaking fee…..
— Learning to Co (@PoliticallyRt) 7 февраля 2019 г.
Hillary Clinton: Trump's INF Treaty Withdrawal is "Gift to Putin"